What Is A Luxury Drug Rehab? Here at United Drug Rehab, we offer a wide variety of benefits, one of which is the option to attend one of our beautiful luxury rehab facilities as opposed to more old-style centers. Some of these benefits include small resident population, privacy, location, as well as 24/7 access to high-quality amenities. Small Resident Population: Because of our small resident population, United Drug Rehab Group can give their highest attention and focus on each individual guest, which is a huge factor in terms of odds of recovery. With less people to occupy our staff, we can make sure we give as much time and effort as possible into each case. High-Quality Amenities: One of the best ways to treat the mind in the midst of your body’s detoxification is to enjoy one of our many luxurious spas and pools. In addition, there are a variety of exercise facilities that can be utilized to keep the body active and healthy. Location: Enjoy the gorgeous sceneries of our landscapes as well as natural settings that not only balance the body’s physical prowess, but essential emotional assistance throughout as well. Many of our previous guests have stated that by rediscovering nature, they have also rediscovered themselves. Privacy: Here at United Drug Rehab Group, we provide our guests with full security as well as privacy. We know that there is a stigma attached to entering rehab facilities, and we are here to protect your identity. We’re not here to shame you, we’re here to help - but if helping means keeping your identity, private, we can accommodate. 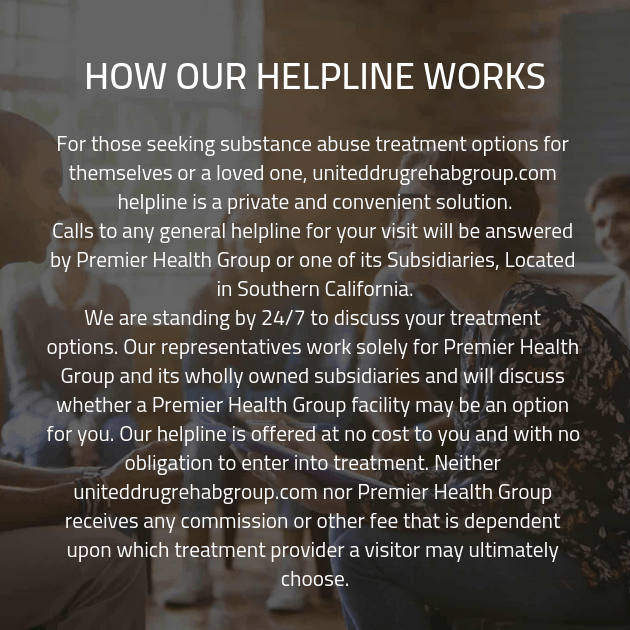 Many of these luxurious benefits cannot be found at most rehab facilities, which is what makes United Drug Rehab Group a truly luxurious and helpful environment. Don’t waste your time going to facilities that only want your money - get real help today. When it comes to addicts with a substance abuse problem, it can be hard to ask for help. There’s a harsh and ever-looming stigma behind the disease of addiction - shame, embarrassment, and above all, fear of failure takes over the desire to benefit oneself, but it’s still a medical disease. All these things can especially be true when one is trying to go through a rehab center, but recovery doesn’t have to be as difficult. United Drug Rehab Group can not only alleviate your nerves, but help build you a stable life and a bright future.